Flier: Fall Healing Retreat "Whispers of Heaven"
Please join Padre Paul and special guest presenters; Dr. Barbara Rose Billings, Angelika Schafer, Robert Bearden, Dana Duryea, along with our musicians, Angelika Schafer, George Lopez, Ryan Rigoli and Francois Levannier. This Fall Retreat will follow up in the beautiful energy created from the Spring Retreat in San Rafael last April. The testimonies from that Retreat were so heart warming and healing. Something is happening in peoples lives who decide to spend 4 days soaking in the The Presence of the Divine for extended periods of time. As Fall approaches we will feel a change that will stir our heart and emotions to keep growing, and expanding our awareness of Heaven Here On Earth! TIP: Why should I consider staying at the Embassy Suites or at another Hotel and purchasing the Meal Plan? CLM suggests staying at The Embassy Suites Hotel and doing the Meal Plan. Because the work often goes very deep and the schedule is unpredictable, being able to walk up to your hotel room at breaks, instead of having to drive home, makes things easier and more efficient for you to receive the fullest benefit of your retreat experience. Please tune in to see what is best for you, but please know that the hotel requests that no outside food is to be brought into the hotel. NOTE: An alternative hotel within driving distance to the Embassy Suites is the FOUR POINTS SHERATON HOTEL in San Rafael, CA. Please register and pay using the Registration Fee ticket item shown above. IMPORTANT: Please be advised that a cancellation fee of $100 towards the CLM Retreat Registration Fee will be charged for cancellations received in writing prior to October 8th, 2018. There will be no refunds after that date. Celebrating Life has created a delicious meal plan for those who desire to EAT IN during our 4-day retreat. A wide selection of foods will be served; including vegetarian, gluten-free, and dairy-free options. The Meal Plan Package includes Buffet Style meals that are served with complimentary coffee, tea, or ice tea. The 5 meals included are: Thursday evening dinner; Friday and Saturday lunch and dinner. All meals will be served in a separate room. Please pay for the Meal Plan ($195) using the ticket item shown above. The Embassy Suites will be accommodating our group with more gluten-free, vegan/vegetarian options. The Hotel desires to inform each guest that should they choose to order anything “extra” (sodas or different meals, etc.) they will be charged individually by cash, credit card or room charges. IMPORTANT: While the Meal Plan is optional, CLM advises ALL participants to purchase the Meal Plan to enhance and deepen their retreat experience, the cost is $195/person. This price includes all service fees and applicable taxes. This price does NOT include breakfast. Breakfast is available for registered hotel guests ONLY! The Meal Plan is non-transferable and any unused meals will not be refunded. Meal Plans must be purchased by October 29th, 2018 at the latest. No Meal Plans will be sold after that date. Any questions concerning the meal plan, email Maya Paul at mayawpaul@gmail.com or call 415-686-1311. IMPORTANT: We have negotiated a Special Group Rate of $174/night for a king suite; $194night for a 2-queen suite. It is advisable to make your hotel reservations as soon as possible. CLM has contracted to reserve a limited number of rooms for this retreat at these prices. Once these rooms are sold out you can still reserve a room, but only at the higher non-contracted rate. The hotel recently started charging a $7 overnight parking fee, but they are waiving it for our CLM group at the November Fall Retreat. Cut-off date to make hotel reservations at these prices is October 8, 2018. The last three years we "sold out" our contacted rooms for Fall Retreats! *CLM STANDARD KING SUITE is $174 plus sales tax of 9.25%, and the hotel occupancy tax of 12%. *CLM DOUBLE/DOUBLE SUITE is $194 plus sales tax of 9.25%, and the hotel occupancy tax of 12%. *Additional adults in a room is charged $15 per person, per day. Individual Guest Deposits/Confirmation: To confirm a sleeping room within your Room Block, the sleeping room must be secured with a valid credit card provided by the guest attending your Event, along with a first night's deposit. Check-In/Out Time: Our check-in time is 3:00 PM, check-out time is 12:00 PM. All guests arriving before 3:00 PM will be accommodated as rooms become available. Hotel’s Front Desk Staff can arrange to check baggage for those arriving early when rooms are unavailable and for guests attending functions on departure day. Early Departure Fee: If a guest who has requested a room within your Room Block checks out prior to the guest's reserved checkout date, the Hotel will add an early checkout fee to that guest's individual account (currently, $50.00). Guests wishing to avoid an early checkout fee should advise the Hotel at or before check-in of any change in planned length of stay. The Hotel will inform your Group attendees of this potential charge upon check-in and requests that you also inform your attendees of this obligation. Want to Share a Room: For those wishing to share a room at this retreat, please contact Cecelia Walsh at auntceilly@comcast.net or 732-556-8151 (New Jersey). There is no guarantee of finding a suitable roommate for you, however, she will do her best to network with others wishing to share a room and to let you know of the possibility. All individual room and food charges are the responsibility of the retreat participant and registered guest of The Embassy Suites. No food is allowed in the Conference areas. Hotel Check-in is 3:00 p.m. Check-out is 12:00 noon. The Embassy Suites and Celebrating Life Ministries do not assume any liability for the damage or loss of property or merchandise left in the hotel, prior to, during or following the retreat. FREE Complimentary parking is provided by the hotel. The Embassy Suites and Celebrating Life Ministries do not assume liability for any damage, lost or stolen items while in the parking facility. The Embassy Suites and Celebrating Life Ministries does not assume any responsibility for personal injuries suffered due to accidents while on their premises. NOTE: We are looking forward to seeing you. If you have any questions concerning this or any other aspect of the Retreat, please feel free to contact CLM Coordinators. The Embassy Suites by Hilton Hotel in San Rafael, CA is located 45 minutes north of the San Francisco (SFO) International Airport or 45 minutes northwest of the Oakland International Airport (OAK). Convenient to theaters, restaurants, and shopping in and around the Greater San Francisco Bay Area. Paul is co-founder of Celebrating Life Ministries with Ron Roth. Paul has a presence and power that moves people to tears when they are near him because of his relationship with the Divine. Experience his Love of the Father and Divine Mother and then watch your spiritual gifts begin to manifest in your own innate healing gifts. Leading prayer & healing services is his strength where signs and wonders follow. Padre Paul has studied and worked along side of his spiritual mentor, Ron Roth, for over twenty-eight years until his passing. 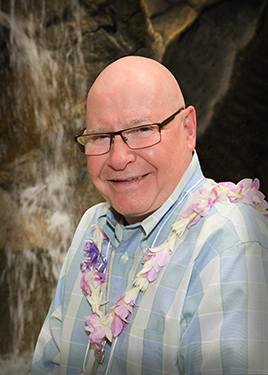 Paul now assumes the role of Spiritual Shepherd of Celebrating Life Ministries and continues to honor the healing legacy of Ron Roth. At this Four Day Healing Retreat, Padre Paul will share healing stories of how God has used him to "heal the sick" and "set people free" from oppression and negative energies. He will lead participants on this inner healing journey in finding where Heaven illuminates the Earth. Come and let your hearts be set aflame with love! Dana is an Ordained Spiritual Healer, a devoted Monk and serves as a Bishop within our Celebrating Life Community. 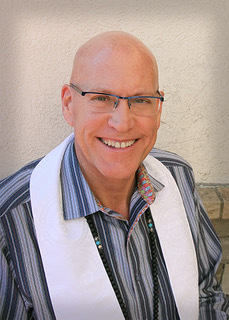 He is also the Founder/Director of the Foundation of Spiritual Development in San Rafael, California. Dana is a great teacher that keeps audiences on their toes as you never know what he might do next in his presentations. Dana's love for science and the mystical adventures he undertakes has demonstrated to him that there is a Force, a Power and a Presence that leads us every single day by our senses, by our intuitions, and by tuning into the Universe where miracles happen. Dana's calming energy and wise observations of how energy works will change the way you see things and help participants find ways to tap into this fire that burns within always. Robert is a crowd favorite here at CLM and other venues. 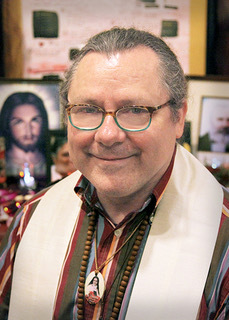 Because of his devotion to the Divine in all that he says and does and the joy he brings to so many souls, he has been invited back to present some healing techniques from his travels to India earlier this year. 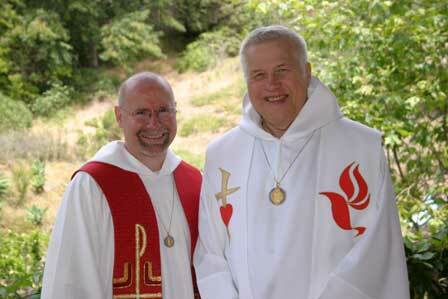 Robert is a Professed Monk, an Ordained Minister and serves as a Bishop within our Celebrating Life Community. He is also an Awakened Oneness Trainer from his studies at the Oneness University in India and resides in San Fransisco, California. 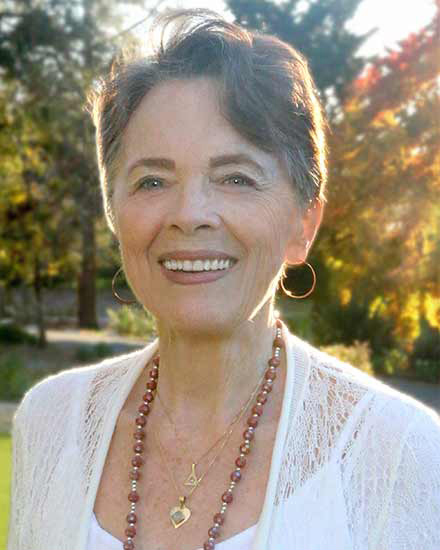 Dr. Barbara Rose Billings is an Ordained Spiritual Healer within CLM. Entering the convent two weeks after turning 18, she made a decision to commit her life to God and to helping others know the Divine. She served as a Sister of Mercy for 30 years. Since leaving the community in 1989 she has continued to devote her life to helping people know God and to heal by nurturing their spiritual lives. She has a solid foundation in theology, education, spirituality, intuitive and healing arts, counseling and spiritual direction--which she prefers to see as spiritual invitation. After being recognized as a Daughter of the Casa, Barbara Rose was invited by the Entities to take groups to John of God and to lead a monthly John of God Meditation in San Rafael. In addition, she sees private clients and plays the harp for healing at Marin General Hospital. She considers it a privilege to be of service to CLM, especially through her ministry of prayer. Angelika’s gift of music touches the heart; through her inspiring compositions, soothing voice and instruments she channels the frequencies and healing energies of the angelic realms and leads us gently into that deeper space within. She sings ancient chants/Prayers from different traditions, Mantras for healing, Bhajans for singing along and her original songs accompanied by a 50 string Tamboura/Monochord and guitar. Several contemporary mystics and masters gave special dispensation for Angelika’s music ministry to conduct powerful blessings. She has published 12 CDs and shares her music and inspirational talks worldwide at spiritual gatherings, ceremonies, conferences and healing retreats. The Fall Retreat will be held November 8-11, 2018 in San Rafael, California. The following schedule is intended as a guide only and is subject to change. NOTE: There will no physical tickets sent to those who register for this event. Instead your name will be listed at the Registration Table upon entering the conference room. Upon your arrival please refrain from wearing frangrances of any kind out of respect for those who are allergic. Thank you. Please remember to bring sacred objects (pictures, statue, rosary, bracelet, etc.) to help build our altar of devotion on Thursday evening. Your object will be blessed throughout the weekend and should be retrieved by you BEFORE your departure on Sunday. Please bring your written PRAYER REQUESTS too, as there will be a Prayer Basket available at this four-day event as we lift up these prayers unto the Lord for healing and restoration. There will also be opportunities during the retreat for you to help bless Celebrating Life Ministries' mission with your prayers and financial support. Donation envelopes will be made available on the registeration table for your convenience. Thank you. All Celebrating Life Ministries events may be recorded and or photographed. Your participation, in whole or part, may be included in an audio or video program or a media publication to be published by Celebrating Life/Isaac Books. Your completed registration grants permission to Celebrating Life Ministries and Paul Funfsinn to publish or use the recordings or your picture. IMPORTANT: NO PROFESSIONAL cameras, video or recording equipment are allowed at events unless approved by Celebrating Life. Feel free to use your digital cameras, smartphones and tablets to post to your Facebook, But NO videos will be allowed to be posted on any media boards/pages of any parts of the Healing Services, which includes Twitter and Instagram accounts. We are looking forward to seeing you at the Retreat. If you have any questions concerning this or any other aspect of the Retreat please feel free to contact CLM. The CLM Retreat Registration Fee of $295.00 is a 100% donation to our Ministry and is tax deductible. The Meal Plan Package Fee is NOT a tax deductible donation, but rather a business expense! Celebrating Life Ministries is a 501(c)3 non-profit organization. All contributions to our organization are tax deductible, as CLM is classified as a public charity under section 509(a)(2) of the Internal Revenue Service Code. This was my first event. I’m so grateful I was able to attend. ???. Thank you for this life changing weekend. There are no words on how powerful this was for me. "The Spring Retreat was a moving, heart-filling, life changing event this past weekend. Thank you! Thank you!" "I feel my personal connection with God so strongly again. I feel him flowing through me and in me and as me and as the world and everyone else. My heart is open to God again and I am in a flow of his love. When I pause and revel in His presence I find myself smiling and laughing for no reason. At the retreat I was able to sing again like my young self, ecstatically praising Him and loving him. My body was moved by Him and I wanted to cry from joy many times." "It was an incredible 4 days! You probably don’t remember, with everyone leaving at the time, but I shared with you that it had a profound effect on me. I have indeed been able to return to “stillness” and sit with the Divine… MUCH more easily than prior to the Retreat and also really have internalized Jesus… much closer … a true friend. Thank you, thank you!" "The first night of the retreat you talked about being broken in order to be rebuilt by the Holy Spirit. Both my brother and I were amongst the first to be called up to receive a blessing. Somehow we ended up standing next to each other, both of us in a bit of a daze and neither of us knowing what to expect. I remember holding onto his hand, my eyes closed. When you came to me, you said something like, "Let go of his hand. We come as individuals, not to carry our family. Surrender, let it be." I began sobbing and shaking, because some of my biggest fears are around separation, responsibility for my loved ones and potentially losing them as I continue on my spiritual path. When you asked me to let go, I fell to the floor in tears and couldn't move my body for quite some time. After the retreat, upon returning home I noticed that my "normal" triggers weren't lighting me up. I was also aware of an increase in the flow of love between myself, my children and my husband. Today Divine Presence is with me at work. I learned that God is good, that he is everywhere and that he truly wants what is best for each of us." "I experienced a feeling of Love for God and Self that was stronger than anything else/all secondary relationships, and this Love is getting stronger. It was the first time I experienced such a palpable feeling that had such strength, knowingness and grace with it, that I know that I am fully supported in my journey of living centered in my relationship with God. I love witnessing how God works in such playful and unexpected ways, yet always hearing us as we are learning to better hear Him/Her. I learned that just being Me is enough, and that is my service."